E-Zee Comfort Just Right 1.3 oz. 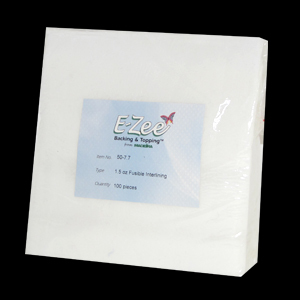 is a smooth, soft cover-all that is fused to the back side of finished embroidery with an iron or heat press. It produces a finished look and feel, and is perfect for children and infant wear and for anyone with sensitive skin. Use on all of your embroidery to add a unique finished look and feel that will put your business above the rest!